Champagne for New Years? Try an Alternative. So you’re looking for a Champagne for New Years Eve but you’re not sure what to get. Here are a couple of pointers to help zero in on the type of Champagne that you want. Things may get a touch confusing to start but I promise everything will be clear by the time we finish explaining it and we’ll finish long before you need to get to that party on the 31st. Also, what’s a little information without a left turn thrown in for fun? Champagne vs Sparkling Wine- What’s In a Name? 2) It was made by a California producer (or any other area in the US) and was called Champagne before 2006 when the US and the EU came to an agreement on a host of food and agricultural terms. If a winemaker starting making a sparkling wine after 2006 or stopped and then started back up after 2006, they cannot use the term “Champagne”. Incidentally, the French are still somewhat incensed that anyone outside of Champagne can call their sparkling wine “Champagne”. You can kind of see their point. In Europe quite often, the name of a wine is taken from the region rather than the grape type. Their view is how can you insinuate that something is actual Champagne, if it’s actually from Bakersfield. So why the dissertation on naming wines when all you want to do is get a couple of bottles to enjoy at a party? Americans tend to use Champagnes as an all-encompassing term, like “Jello” for actual gelatin or “Kleenex” for tissues but calling all sparkling wines “Champagne” cuts down on a lot of options. Ok…so we’ve established that just because something is a sparkling wine, it doesn’t have to be Champagne. 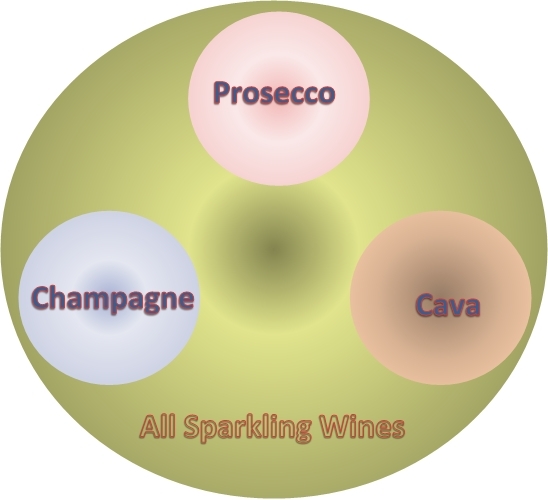 The other two well-known European sparkling wines come from Italy and Spain. Cava, the Spanish sparkling wine comes from just south of the city of Barcelona in Catalonia. The most famous Cava in the US is Frixenet, not because it is particularly good but because they were very good marketers. Prosecco, comes from a wine region just north of Venice, centered on the village of Prosecco. In the US, Prosecco has a somewhat underserved reputation for being bad Champagne. Nothing could be further from the truth, as we learned while travelling in Italy this summer. Just like any other wine, there are good Proseccos and bad Proseccos. If you are looking for good value for a really nice sparkling wine, we recommend Acinum NV Prosecco. In the Bay Area, it can found at number of wine shops for less than $10.00. Generally, only those shown in bold lettering are commonly available except in specialty wine shops. 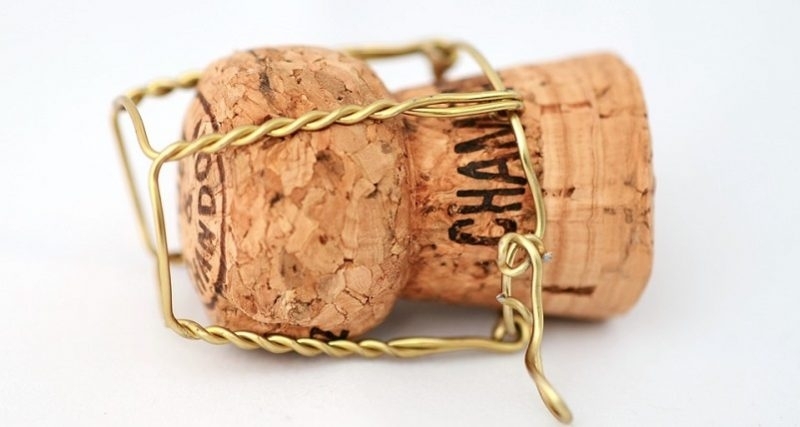 One final hint…Champagne can be difficult to open if you don’t know a couple of simple tricks. First, remember that the Champagne cork (or Cava or Prosecco) corks are under high pressure and can be dangerous. A friend of mine, who worked as a bartender, lost her vision in one eye when a Champagne cork popped out of the bottle and hit that eye. 1) Always open a sparkling wine bottle pointed away from you and your company. 2) Gently remove the foil and don’t shake the bottle. 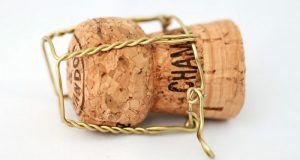 That hyperactive fountain of wine, shown when sports teams win a championship, is just for show and pretty dangerous as well because the shower of champagne is preceded by a cork “bullet”. 3) Hold the cork with your hand covering the top to capture it if it decides to emulate a missile. 4) Now here is the trick…hold the cork still and gently twist the bottle in one direction while pulling up slightly on the cork. You will feel the pressure on the cork build as the friction between it and the bottle lessens as it begins to come free of the wine bottle neck. Continue turning the bottle and hold the cork tightly until it gently comes free. If you have done it correctly, at most you should hear a small, satisfying “ hiss” of the CO2 escaping from the bottle. Winey-Sage.com wishes you a happy and healthy 2018!